Spring is in full swing and for horses on pasture that means one thing: lots of fresh, new grass. What’s the big deal about pasture, anyway? It’s just grass, right? Read on for the scoop on a grazing horse’s diet staple, good old Vitamin G.
Pasture is a surprisingly good source of dietary energy and protein for horses. However, the nutritional content of a particular pasture is dependent on the season and the type of grass, as well as soil health, rainfall and a myriad of other aspects. For starters, consider season. Pasture has two general growth periods. The first occurs in the spring (and to a lesser extent, fall) when pasture is undergoing rapid growth; this is called the vegetative stage. The second growth period is during the summer. Caloric density and protein levels are generally lower in pasture during the heat of the summer. A good example of this seasonal variation can be found in Kentucky bluegrass, a common type of grass in the Midwest. During its vegetative phase, Kentucky bluegrass contains about 17.4% crude protein. During the summer, however, this same pasture type contains about 9.5% crude protein. In general, for optimal gut health, an adult horse should consume approximately 1 to 2 percent of his body weight in forage every day, either through pasture or hay. For a 1000-pound horse this means a minimum of ten pounds of pasture a day. On average, a horse needs to graze for eight to ten hours in order to consume ten pounds of grass. Grazing periods less than this usually require additional supplementation in the form of hay. Active working horses, growing youngsters, and pregnant mares will also require additional supplementation in the form of a concentrated feed. Just as there are different breeds of horses, there are different types of pasture. Pasture contents comes in two major types: legumes and grasses. Compared to grasses, legumes are generally higher in protein and energy. The most common examples of legumes are alfalfa and clover. These are also commonly cut, dried, and made into hay. Most pastures containing legumes intended for grazing horses are not 100% legume but instead are a mix of legume and grass. Grasses are subdivided into cool-season and warm-season grasses, named for the temperatures in which they grow the best. Cool-season grasses include Kentucky bluegrass, orchard grass, bromegrass, tall fescue, and timothy. These grasses have the most growth when temperatures range between 60 and 80 degrees F. Warm-season grasses include Bermuda grass and bahia grass. These species grow best when temperatures remain above 70 degrees. Your location within the country will often dictate what grass or mix of pasture your horse has access to. If you’re curious about what is in your pasture and its nutrient content, it’s easy to find out. Contact your local university extension office. You should be able to send a sample of your pasture there for analysis. 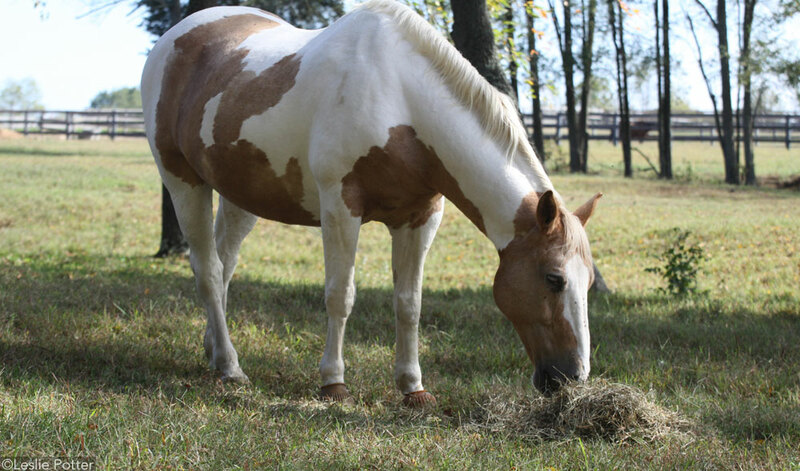 Horses should consume about 1 to 2 percent of their bodyweight in forage each day. If your horse doesn’t have enough access to grass to consume that much, you’ll need to supplement with hay. When Is Good Grass Too Good? While it’s nice to have high quality pasture, sometimes the grazing is a little too good, especially for horses that are not in work and are “easy keepers.” During rapid growth periods, especially in the spring, pasture contains an abundance of nonstructural carbohydrates. These include sugars, starches, and fructans. Sudden high levels of these compounds in a horse that has only been fed hay or poor-quality winter pasture can cause major disruptions in insulin levels, predisposing some horses to laminitis, weight gain, and metabolic issues. For this reason, during periods of rapid pasture growth, a horse’s grazing period might need to be reduced to prevent illness. When introducing a horse to new, lush spring pasture, a good rule of thumb is to start slowly. Allow your horse to graze for one hour for starters. Every few days, increase grazing time by thirty minutes. In about a month, your horse should be accustomed to the new growth and be ready to graze for a full day as long as he remains at a health body condition for his activity needs. 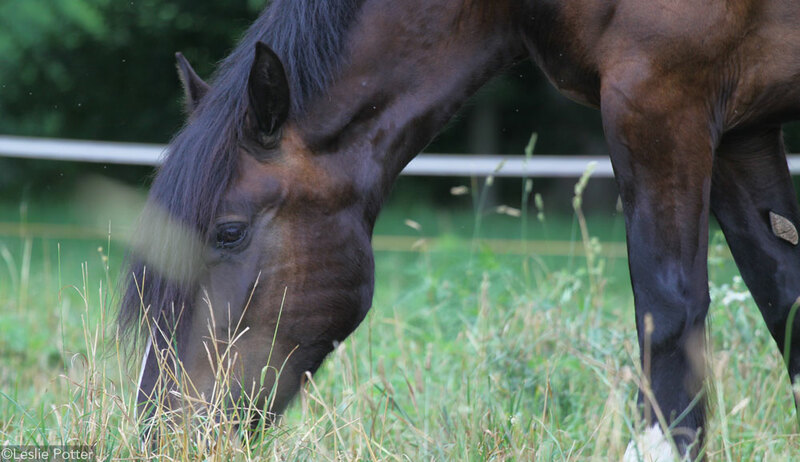 Remember: a horse’s nutrient requirements from pasture vary widely depending on many factors. If you’re concerned about your horse’s diet, be sure to talk to your veterinarian. A lot of good points in this article.